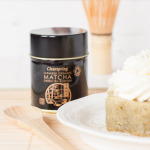 Inspired by the classic Italian pudding of tiramisu my version is made with matcha and also flavoured with coconut. A Japanese twist on an Italian classic. Traditionally used in the tea ceremony, matcha is the finely stone ground leaves of shade grown green tea, it is a vivid green and exceedingly finely ground – it feels like talc between your fingers – it can take up to an hour to grind around 30g of matcha and because of the labour intense method of production good quality, ceremonial grade matcha is much prized and expensive. In modern Japan matcha is used to flavour all manner of food, from noodles, to puddings and even kit kats. Its bitterness makes it perfect for savoury foods, and when sweetened it is delicious in sweets and puddings. Although delicious, coconut oil is higher in both calories and saturated fats than butter (20% and 68%) respectively. However not all saturated fats are equal, coconut oil contains lauric acid commonly regarded as being beneficial, and being a plant based it is cholesterol free. There is no doubt that this pudding is a treat, and it is an indulgence to use so much good quality coconut oil for it; a little goes a long way and I think that apart from special occasions coconut oil is best reserved for flavouring smoothies or raw treats. You can also serve this pudding in glasses, break up the sponge, soak it in the syrup and top with the cream. Love coconut? Then try my coconut layer cake! If you try this Recipe: Coconut Matchamisu please tag #FussFreeFlavours on Instagram or Twitter. It is amazing for me when for me when you make one of my recipes and I really do love to see them. You can also share it on my Facebook page. Please pin this recipe to Pinterest too! Thanks for reading Fuss Free Flavours! 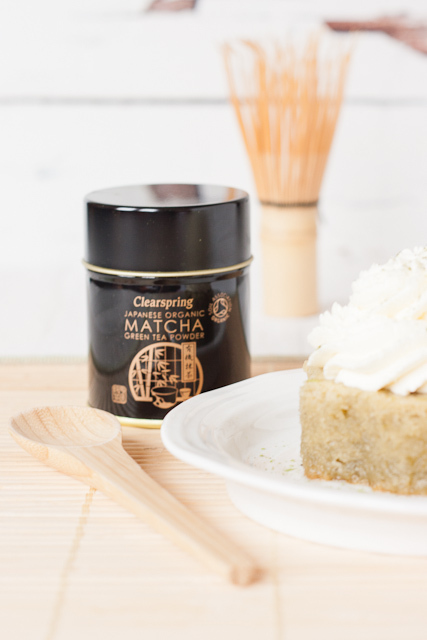 This Japanese twist on an Italian classic consists of a coconut sponge soaked in matcha syrup topped with a swirl of coconut cream and a dusting of matcha. Organic coconut oilnofollow and ceremonial grade matchanofollow used were both from Clearspring. Place the sugar and water into a saucepan and bring to the boil. Allow to simmer for about 5 minutes to form a sugar syrup. Remove from the heat, allow to cool and whisk the matcha in. Strain and allow to cool. Cream the coconut oil and sugar together with a hand held mixer or in your stand mixer. Add the eggs together with a tablespoon of the flour and beat well. Sieve the flour, baking powder, salt and matcha and fold into the batter along with the milk. Divide the mixture between the two prepared tins and smooth out using a knife. Bake for about 20 minutes. The cake is done when risen and springy. Remove from the oven and allow to cool for 5 minutes before turning out onto a wire rack. Whisk the cream and coconut oil with an electric mixer until the cream holds a peak. Use a round 7cm cookie cutter to cut 6 circles from the cake. 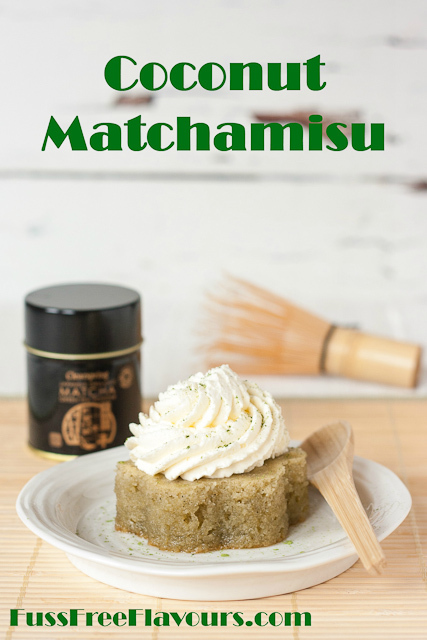 Stand the cut cake in a shallow dish and pour the matcha syrup over. Turn the cakes once so they soak up the syrup. Transfer the cakes to their serving plates, fill a piping bag with a star nozzle and pipe a rosette of the coconut cream onto each, and dust with a sprinkling of matcha.